VIA Technologies, Inc, a leading innovator of power efficient x86 processor platforms, today announced the world's first quad core Mini-ITX boards featuring the latest VIA QuadCore E-Series processor. The VIA EPIA-M900 and VIA EPIA-M910 are the first two Mini-ITX boards to feature the 1.2GHz VIA QuadCore E-Series processor, offering enhanced multi-tasking and superb multimedia performance on the lowest quad core power budget for next generation embedded products. 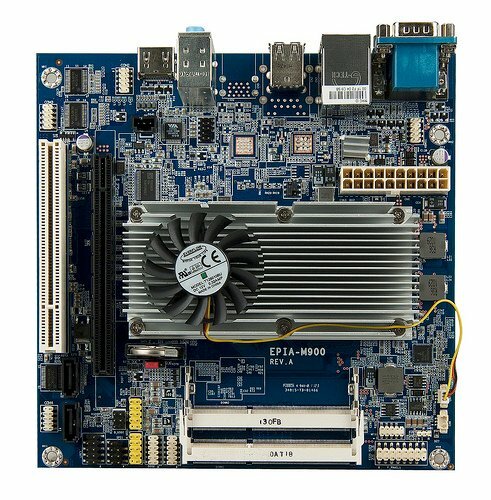 Measuring 17cm x 17cm the VIA EPIA-M900 Mini-ITX board features the choice of a 1.2GHz VIA QuadCore E-Series processor or a 1.6GHz dual core VIA Nano X2 E-Series processor. Paired with the VIA VX900 MSP, supporting up to 8GB of DDR3 system memory and featuring the VIA ChromotionHD 2.0 video processor, the VIA EPIA-M900 enables the creation of a wealth of innovative next generation digital signage, POS, Kiosk, ATM, home automation, healthcare and media client system design applications.